11 L solution tank helps reduce tank empties and lets you clean uninterrupted for up to 30 minutes. Convenient debris tray reduces operator contact with recovery water, and prevents clogged hoses and drains for increased safety. 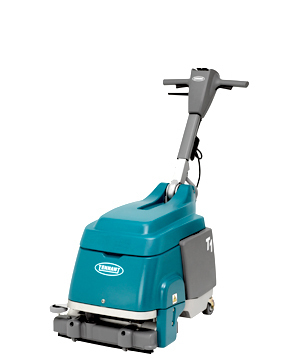 Deliver consistent scrubbing results in small, tight spaces with this easy-to-operate and maintain scrubber-dryer that provides peak performance year after year due to quality engineering. Hassle-free squeegee system simplifies maintenance with a squeegee that never needs adjustment.